Over 60 groups of guests visited Abbey Fields in Hucknall at the launch event for the housebuilders Sherwood Gate development, which is being built on land off Papplewick Lane in the parish of Linby. 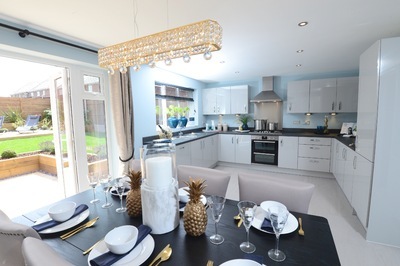 The first homes were released for sale at the event, and Bellway drafted in extra members of their sales team to help deal with the high demand from home-hunters. Three sales were made on the evening, with the first being completed within 15 minutes of the launch event beginning. Sherwood Gate will feature 237 new homes, including three, four and five-bedroom homes, land for a new primary school and an ecology park once complete. Sales Director for Bellway’s East Midlands division, Ben Smith, said the event had been a great success. He said: “We have been receiving a lot of enquiries about the homes at Sherwood Gate ever since we started work on site, so we were expecting a good turn out to our launch event, but the success of this event surpassed our expectations. We have already sold three homes and have appointments lined up for many more to reserve, which is fantastic. We’ve got a good knowledge of the area thanks to our work at Abbey Fields over the last few years, and we knew there was a large demand for homes, which this has certainly proved. “Sherwood Gate will feature a wide range of homes which will offer different options for different buyers. There are homes here which would make ideal first homes, and large executive style homes which would be perfect for people who enjoy hosting family and friends and are on the look out for more space. Three, four and five-bedroom homes are now available to buy at Sherwood Gate, with prices starting from £190,000. For more information, go to bellway.co.uk.